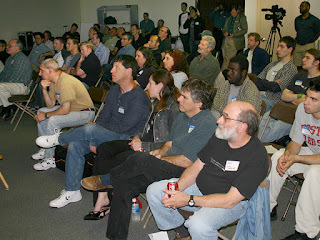 The crowd at a Boston Avid Users Group Meeting. Back in 1992 Avid had its first Annual International Avid Users Group Meeting. The meeting was a great chance for Avid editors from all over the world to get together and talk shop. Not to mention, it was a few days of workshops where an editor could learn anything from digital media management to compositing and effects. For a couple of years, I was privileged to run the effects in Media Composer sessions with another Avid editor. It was always educational and a lot of fun. I'm not exactly sure why Avid chose to abandoned the International Avid User Group Meeting, but it's my guess it had to do with cutting costs. It's a shame, instead of paying for a focus group, Avid had editors from every demographic paying them to consult on product direction. Over the years, a lot of the editors I've talked to, remember those meetings fondly. When the International Avid Users Group Meetings stopped, the Avid Master Editor Workshops somewhat filled the void. In order to attend one of the Avid Master Editor Workshops, an editor had to apply by filling out an application and submitting a sample of his or her work. Although not the same as the International Avid Users Group Meetings, the Avid Master Editor Workshops gave elite editors the chance to meet other editors from around the globe, attend workshops and share experiences. After a few years, the Avid Master Editors Workshop was also dropped as an event. This leaves the local Avid Users Group Meeting as your best bet to meet with other editors and discuss shared experiences. These meetings can be a great opportunity for networking and meeting other editors in your community. Keep an eye open for your local meeting, most of them are free and are an abundant source of information. I was on the board of the Boston Avid Users Group when it was rebooted in 2004 and it continues to be a central part of the Avid editor community. I'm hoping that the video software manufacturers, such as Avid, don't overlook the value of maintaining a user community. The opportunity to meet with their users on a regular basis can be as valuable to the software companies as it is to the editors in attendance.